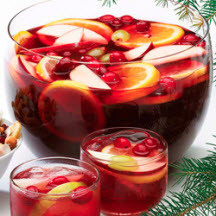 This spirited punch is a great choice for fall and winter holiday parties. Combine first 5 ingredients in a punch bowl. Add fruit. Add the sparkling water just before serving. Makes approximately 10 (5-ounce) servings.